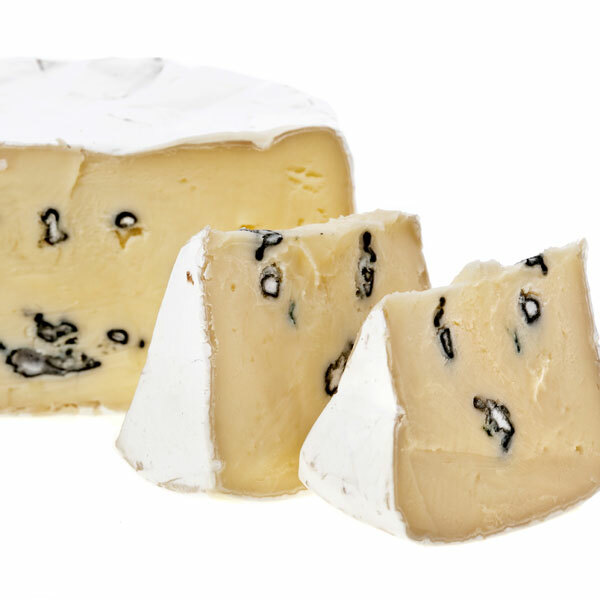 Cambozola is a triple cream, brie-style blue cheese made from pasteurised cow’s milk in the German region of Allgäu. The cheese is injected with same blue Penicillium roqueforti mold used to make Gorgonzola, Roquefort, and Stilton. However, it is neither pungent like Stilton, nor crumbly like Roquefort. The cheese, a cross between Camembert and Gorgonzola, is creamy, moist and rich like a Camembert with the sharpness of Gorgonzola. A soft-ripened cheese, the insides reveal pockets of blue veining and a unique exterior of grey mold. Its savory, nutty flavour with undertones of sweetness enhance the wonderful characteristics of the cheese. For a food connoisseur, the Cambozola is a great start into the world of Blue Cheeses. Taste it with fruits, honey or a Chardonnay.